In the early to mid-1980s, local business leaders and the Lincoln Mill Associates began to explore the possibility of creating a performing arts center in the new Millfront Marketplace in downtown Lincoln. The goal was to create an organization that would both benefit the local culture and the tourist experience. In 1986, the North Country Center for the Arts (NCCA) was formed as a non-profit arts organization, with the original Board of Trustees including both members of the Lincoln Arts Council and local leaders in business. 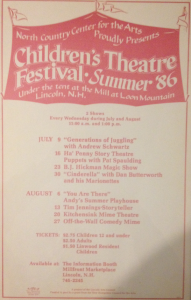 To gauge local interest in the arts, NCCA (with support from the Lincoln Arts Council) produced its first formally planned and produced event in the summer of 1986 — a two-month long Children’s Theatre Festival under a tent at the Mill at Loon Mountain. The response to the festival was clear — support for the arts in Lincoln was great. NCCA quickly hired its first Producing Director, Van McLeod, to build the foundation for what would eventually become the Papermill Theatre Company and Jean’s Playhouse. The next summer, in 1987, NCCA transformed the paper mill in Lincoln (the former industrial center of the community, officially closed since 1980) into the Papermill Theatre, and produced its first professional mainstage season. Productions of the inaugural season included Carnival, Harvey, Deathtrap, and Cabaret. 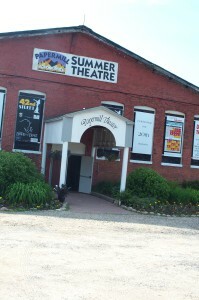 Over more than two decades, the Papermill Theatre would perform over 80 professional productions in the historic paper mill building and establish a reputation for excellence, winning many New Hampshire Theatre Awards and becoming a vibrant center for the arts in New Hampshire and New England. After years of success in the restored paper mill building, NCCA played its final summer season in the Papermill Theatre in 2009, producing Smokey Joe’s Cafe, You’re a Good Man, Charlie Brown, and On the Town. That fall, the paper mill was demolished, making way for the new facility that would house the NCCA performing arts companies of Lincoln — Jean’s Playhouse. 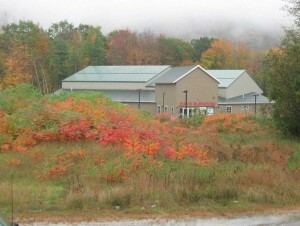 Jean’s Playhouse was officially introduced with a gala performance grand opening in July of 2012, after two summer seasons performed at the Governor’s Lodge at Loon Mountain. 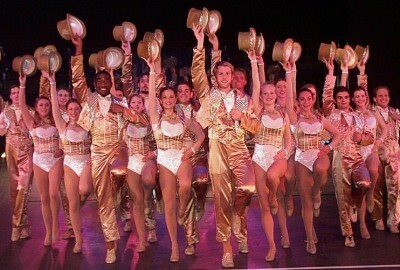 The first summer season at Jean’s Playhouse included professional Papermill Theatre Company productions of The Wedding Singer, Dirty Rotten Scoundrels, and A Grand Night for Singing. Named for long-time NCCA supporter and community leader Jean Hallager, the state-of-the-art facility allows year-round production of high-quality performances and includes box office, concessions, storage, and rehearsal space. The organization that originally sat audiences in folding chairs and seats recovered from a burlesque house (by Bill and Jean Hallager), now offers a comfortable and relaxing atmosphere for the enjoyment of plays and more. Jean’s Playhouse reflects the vision of those who originally proposed and created NCCA in the years leading up to 1986, enhancing the culture of the White Mountains region for locals and tourists alike. Housing the professional, community, and educational companies of NCCA (Papermill Theatre Company, IMPACT Children’s Theatre, Playhouse Players, and Jean’s Teens), Jean’s Playhouse is a valuable gem of the Lincoln-Woodstock community and a prized attraction for tourists from around the country. Jean's Playhouse boasts alumni all across the country. Browse the alumni network to see where past artists are now. Are you an alumnus of the Papermill Theatre Company, IMPACT Children's Theatre, or Playhouse Players? Jean's Playhouse wants to connect! Visit the page to submit your info.